For first ladies, fashion is about more than just putting on a pretty outfit. First lady Melania Trump showed her American pride Friday by stepping out in a powder blue ensemble for the inauguration of her husband, President Donald Trump. The designer? Ralph Lauren, who's an iconic American name in the fashion world. He's so iconic, in fact, he's been tapped to dress Team USA for the opening ceremonies for five Olympic games. Related Story Do We Really Need A First Lady? But fashion is no longer just about wearing a pretty outfit. For first ladies — whose outfits are usually heavily scrutinized — fashion can be used to send a message. For instance, Michelle Obama conveyed a message of diplomacy during most state dinners by wearing a dress by a designer from the visiting country. And some thought it was no coincidence that Obama wore Italian designer Gucci to the 2016 Kennedy Center Honors. It was held on the same day as the Italian referendum, which resulted in the country's prime minister resigning. The fact that Melania Trump wore a U.S. designer seems to go hand in hand with her husband's agenda to increase American manufacturing. But the new first lady could also be sending a message of bipartisanship. Ralph Lauren is a go-to favorite of Hillary Clinton, having designed many of her now-famous pantsuits. She even wore another one to Friday's inauguration. Trump started sending subtle messages to the public with her fashion choices prior to Friday. She specifically chose a military-inspired coat for Thursday's wreath-laying ceremony at Arlington National Cemetery in honor of U.S. service members. 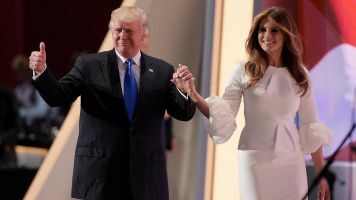 And later that night for a black-tie dinner, she chose a dress by Lebanese designer Reem Acra, who immigrated to the U.S. Trump is only the second first lady to be born abroad.